A new picture for a new little lady. This week has been somewhat crazy. I haven’t been doing any sales this year as I feel busy enough with little man and a little lady on the way, however when an opportunity came up to have a table at a local tearoom’s Christmas Shopping nigh, I jumped at the chance. The only problem was I had less than a weeks notice, so this week I have had to put all other projects on hold while I dig out all my stock, go through it (trying to be objective about what I feel might sell) and get a few new, updated bits done (to be more in line with what’s on my facebook page). I have also been playing with a few kits but to be honest, although I had all the components, I didn’t have enough time to present them well enough to sell. Anyway, I had fun and I’m thankful for The Little Teapot for having me along. So apart from that, what have I been up to? Well, anyone who follows me on twitter will have seen me tweet about a little project I decided to try last week. 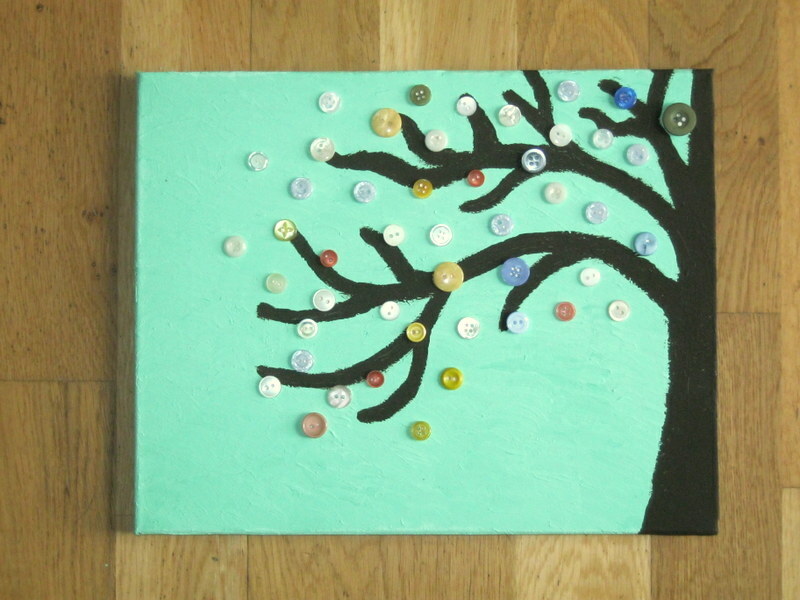 Inspired by the lovely work of Busted Button I decided to make a little picture of my own to go in baby’s new room (which we are starting to get ready now – she’s not coming until sometime in March but I know it will take us that long to get sorted!). Here’s what I started by doing. Now I’m probably going to horrify a good number of you by admitting this but as I don’t paint (as you can see from the quality of my tree!) I actually used stuff left over a pound shop trip I made last year. 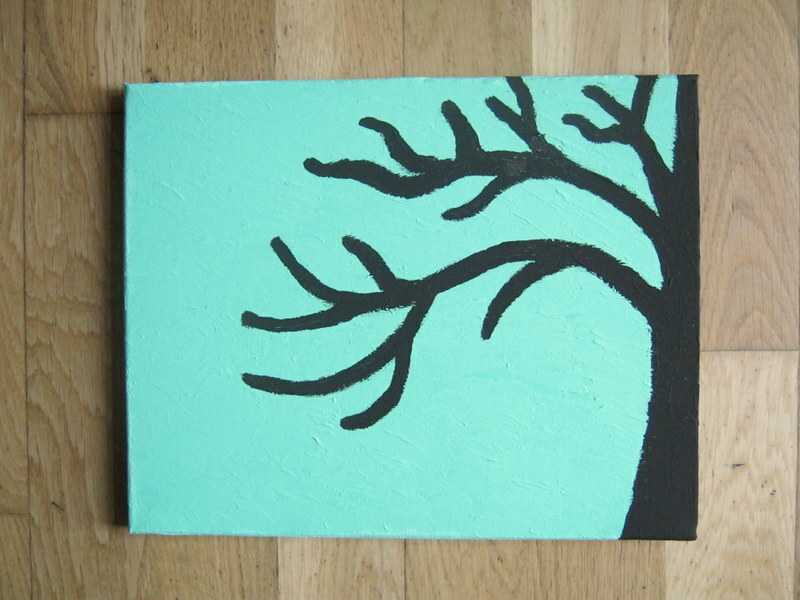 At the time we bought a set of acrylic paints and 2 canvases (both with a paint by numbers kind of thing on them). Last year I used the paints to make Christmas decorations. I managed to root them out and mix them until I got the shades I wanted for my tree. 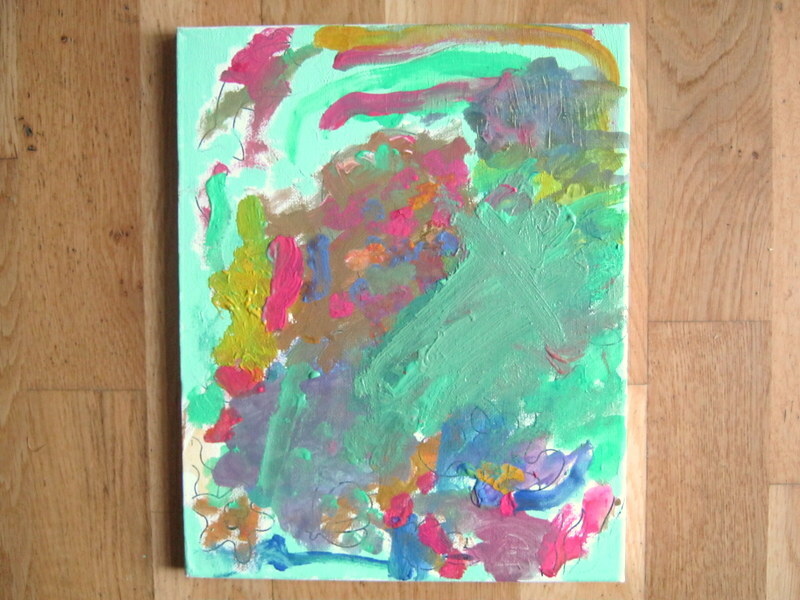 Little man used the other canvas at the same time and we had a lovely afternoon paining together. Here’s what he did. He kind of did a tree up one side, painted a rainbow at the top and then later added more blobs of colour (inspired by how I was finishing my painting off, which you’ll see in a moment). Bearing in mind that he’s not quite 3 yet, I thought it was better than most of the stuff I do! I was particularly impressed how carefully he painted. He didn’t spill any paint; paint himself; or spill water (apart from once, which was my fault, I put it too near the edge). We’ll probably add some glitter to it before it goes up on his wall (what toddler doesn’t like sparkly things?). Anyway, would you like to see my finished picture? I’m really proud of it, although don’t look too hard at busted button because her stuff is so much better than my attempt! Still it was fun. I had a nervous moment when I started sticking the buttons on. I used copydex, and was worried it wouldn’t work (the buttons looks great where they were, I didn’t want to ruin the effect! ), it did and it looks great. When we sort the room out, and I manage to put it up on the wall, I’ll take a picture of it. It was really fun to do, so have a go! ‘Busted Button’ is a great blog and has a number of tutorials (she is very generous and walks you through how she creates her pictures). Well I think that’s all for this week. I’m going to put my feet up with a glass of non-alcoholic mulled wine and enjoy a little peace and quite before the crazy weekend starts! I love this Rachel! What a great idea to use to £1 shop paints etc with the little one – I bet he had a ball!